Some of the character concepts from the United States Garbage Pail Kids All-New Series 6 were similar to character concepts from other non-sports sets and previous Garbage Pail Kids series. Some of the similarities may have been coincidental, but there also were some that appeared to be intentional. 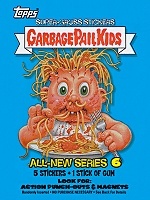 There were concepts used in the All-New Series 6 that followed similar themes as other non-sports sets and previous Garbage Pail Kids series. This section provides descriptions of the similarities between these All-New Series 6 characters and other non-sports sets and previous Garbage Pail Kids series. While it may be a stretch to see some of the similarities, this section also provides an opportunity to view more of the artwork from the All-New Series 6, previous Garbage Pail Kids series, and some of the other non-sports sets. There are a few non-sports sets referred to in this section: Bathroom Buddies, The Sloppy Slobs, and Trash Can Trolls. The Bathroom Buddies were produced by Topps back in 1996. The Sloppy Slobs were produced by Merlin Publishing Limited back in 1993. Any of the All-New Series Garbage Pail Kids characters that are similar to The Sloppy Slobs characters are only similar by coincidence. Merlin Publishing Limited was purchased by Topps in 1995 and eventually became Topps Europe Limited. The Trash Can Trolls were produced by Topps back in 1992. The United States Garbage Pail Kids All-New Series 6 character 1a Orange Julius / 1b Peeled Neal has a similar theme as the United States Garbage Pail Kids Series 9 character 341a Juicy Bruce / 341b Fruity Rudy. Both of the characters have heads that are oranges. The All-New Series 6 character is being peeled, and the Series 9 character is being juiced. John Pound was the artist who painted the All-New Series 6 character, and Tom Bunk was the artist who painted the Series 9 character. The United States Garbage Pail Kids All-New Series 6 character 5a Canned Carl / 5b Dogged Doug is almost identical to the United States Garbage Pail Kids Series 9 character 362a Doug Food / 362b Nick Yick. Both of the characters are dog food being fed to a dog. The All-New Series 6 character is sliding out of a can like a gelatinous glob of dog food, and the Series 9 character is mushy, brown dog food that was already put into a dog bowl. Both series use the first name Doug for one of the character names (All-New Series 6: 5b Dogged Doug and Series 9: 362a Doug Food). Brent Engstrom was the artist who painted the All-New Series 6 character, and John Pound was the artist who painted the Series 9 character. The United States Garbage Pail Kids All-New Series 6 character 7a Hangin' Hayden / 7b Hung Hunter is very similar to the United States Garbage Pail Kids Series 9 character 377a Closet Clyde / 377b Hooked Howie, and it has a similar theme as the United States Garbage Pail Kids Series 9 character 378a Empty Emmy / 378b Ragged Aggie. All three of the characters were being hung up like a piece of clothing. The All-New Series 6 character and Series 9 character 377a Closet Clyde / 377b Hooked Howie were hung up on a coat rack. The All-New Series 6 character was on a standing coat rack, and the Series 9 character 377a Closet Clyde / 377b Hooked Howie was hung on a wall-mounted coat rack. The other Series 9 character, 378a Empty Emmy / 378b Ragged Aggie, is a rag that was hung on a nail. Brent Engstrom was the artist who painted the All-New Series 6 character, James Warhola was the artist who painted the Series 9 character 377a Closet Clyde / 377b Hooked Howie, and John Pound was the artist who painted the Series 9 character 378a Empty Emmy / 378b Ragged Aggie. The United States Garbage Pail Kids All-New Series 6 character 9a Carol-Sel / 9b Mary Go Round is very similar to the United States Garbage Pail Kids Series 8 character 295a Charlie Horse / 295b Amusement Parker. Both of the characters are part of an amusement park merry-go-round. The All-New Series 6 character is "non-violently" impaled on one of the poles of the merry-go-round, and the Series 8 character is a jockey that is riding a horse that was impaled on a pointed merry-go-round pole. Brent Engstrom was the artist who painted the All-New Series 6 character, and James Warhola was the artist who painted the Series 8 character. The United States Garbage Pail Kids All-New Series 6 character 10a Nested Ernesto / 10b Elliot Nest has a similar theme as the United States Garbage Pail Kids Series 9 character 337a Early Bert / 337b Rotten Robin and the United States Garbage Pail Kids All-New Series 5 character 14a Regurgita-Ted / 14b Zack Snack. All three of the characters revolve around birds and bird nests. The All-New Series 6 character is the bird's nest, the Series 9 character is being fed to birds in a bird's nest, and the All-New Series 5 character is being fed by a bird in a bird's nest. The All-New Series 6 character and the All-New Series 5 character have very similar facial features and styling. John Pound was the artist who painted the All-New Series 6 character and All-New Series 5 character, and Tom Bunk was the artist who painted the Series 8 character. The United States Garbage Pail Kids All-New Series 6 character 13a Tara Too / 13b Naughty Natalie has a similar theme as the United States Garbage Pail Kids All-New Series 1 character 325a Drew Tattoo / 25b Marked Mark. Both of the characters revolve around tattoos. The All-New Series 6 character is a tattoo of a girl who is vomiting, and the vomit is coming out of the tattoo. The Series 9 character is being attacked by a snake tattoo, and the snake is coming out from the center of the character's chest. John Cebollero was the artist who painted the All-New Series 6 character, and Tom Bunk was the artist who painted the All-New Series 1 character. The United States Garbage Pail Kids All-New Series 6 character 14a Deli Connor / 14b Cole Cut has a similar theme as the United States Garbage Pail Kids Series 5 character 192a Delicate Tess / 192b Hamburger Pattie. Both of the characters are being displayed in a deli. The All-New Series 6 character was dismembered and displayed in a deli case, and the Series 5 character was hung up in a deli like a slab of meat. John Pound was the artist who painted the All-New Series 6 character and the Series 5 character. The United States Garbage Pail Kids All-New Series 6 character 16a Hacked Hogan / 16b Russel Mania has a similar theme as the United States Garbage Pail Kids Series 4 character 132a Bony Tony / 132b Unzipped Zack and the United States Garbage Pail Kids Series 13 character 502a Gory Laurie / 502b Undead Ned. All three of the characters are being opened up to show their insides. The All-New Series 6 character is wrestler Hulk Hogan tearing open his chest to reveal his skeleton, the Series 4 character is unzipping his face to reveal his skull, and the Series 13 character is unzipping his skeleton to reveal a full-flesh, "normal-looking", character. Luis Diaz was the artist who painted the All-New Series 6 character, John Pound was the artist who painted the Series 4 character, and Tom Bunk was the artist who painted the Series 13 character. The United States Garbage Pail Kids All-New Series 6 character 17a Scott Pocket / 17b Cal Zoned is very similar to the United States Garbage Pail Kids Series 5 character 185a Fran Furter / 185b Hot Doug. Both of the characters are food items that were being eaten. The paintings for both characters show the eater's hand and mouth, and they are horizontal paintings. The All-New Series 6 character is a calzone that is being eaten, and the Series 5 character is hot dog that is being eaten. John Pound was the artist who painted the All-New Series 6 character, and Tom Bunk was the artist who painted the Series 5 character. The United States Garbage Pail Kids All-New Series 6 character 22a Tailored Tyler / 22b Mitch Stitched is similar to the United States Garbage Pail Kids Series 9 character 346a Peeled Paul / 346b Skin Les, and it is also has a similar theme as the United States Garbage Pail Kids Series 14 character 577a Sown Sonya / 577b Stitchin' Tyne. The All-New Series 6 character and Series 9 character 346a Peeled Paul / 346b Skin Les revolve around the idea of skin suits. The All-New Series 6 character is sewing his skin suit on a sewing machine, and the Series 9 character 346a Peeled Paul / 346b Skin Les is removing his skin suit. The Series 14 character was caught in a sewing machine and is being stitched. Luis Diaz was the artist who painted the All-New Series 6 character, and John Pound was the artist who painted the Series 9 character and the Series 14 character. The United States Garbage Pail Kids All-New Series 6 character 24a Bunk Ben / 24b Tom Bunk is very similar to the United States Garbage Pail Kids Series 15 character 609a Dewy Dewey / 609b Dank Frank. Both of the characters are flooding their rooms with urine while they are in bed. The All-New Series 6 character is a child who is urinating in a bunk bed, and his urine is streaming down and flooding the room. The Series 5 character is a child who is urinating in a crib, and his urine is streaming down and flooding the room. John Pound was the artist who painted the All-New Series 6 character, and Tom Bunk was the artist who painted the Series 15 character. The United States Garbage Pail Kids All-New Series 6 character 26a Mike Strike / 26b Bowling For Dallas is exactly the same as the United States Garbage Pail Kids Series 8 character 301a Bowling Elaine / 301b Mike Strike. Both of the characters are bowling balls crashing into pins in a bowling alley. Both characters use "Mike Strike" (All-New Series 6: 26a Mike Strike and Series 8: 301b Mike Strike) and "Bowling" (All-New Series 6: 26b Bowling For Dallas Series 8: and 301a Bowling Elaine) in the character names. Luis Diaz was the artist who painted the All-New Series 6 character, and Tom Bunk was the artist who painted the Series 8 character. The United States Garbage Pail Kids All-New Series 6 character 29a Rasta Roni Tony / 29b Spaghetti Eddy has a similar theme as the United States Garbage Pail Kids All-New Series 3 character 3a Saucey Sarah / 3b Mary Nara, and it is exactly the same as the Trash Can Trolls character 3a Al A. Carte / 3b Freddy Spaghetti. All three of the characters are eating spaghetti. The All-New Series 6 character and the Trash Can Trolls character have the spaghetti coming out from the top of their head, and the All-New Series 3 character has the spaghetti on top of her head. John Pound was the artist who painted the All-New Series 6 character, and Tom Bunk was the artist who painted the All-New Series 3 character and Trash Can Trolls character. The United States Garbage Pail Kids All-New Series 6 character 30a Clawed Claude / 30b Roy Toy has a similar theme as the United States Garbage Pail Kids Series 15 character 600a Vendo-Matt / 600b Doug Slug and the United States Garbage Pail Kids All-New Series 1 character 29a Vendin' Brendan / 29b Cheap Chad, and it is exactly the same concept as The Sloppy Slobs character 81 Sue Venir. All four of the concepts revolve around vending machines. The All-New Series 6 character is inside of a claw vending machine (crane game) as a prize, and that is also the same concept as The Sloppy Slobs character. The Series 15 character is inserting his head into a vending machine as the payment. The All-New Series 1 character is caught inside of a capsule vending machine. Luis Diaz was the artist who painted the All-New Series 6 character, John Pound was the artist who painted the Series 15 character, and Tom Bunk was the artist who painted the All-New Series 1 character. The United States Garbage Pail Kids All-New Series 6 character 32a Thomas The Train Wreck / 32b Off The Rails Gail has a similar theme as the United States Garbage Pail Kids Series 10 character 393a Jess Express / 393b Choo-Choo Trina, the United States Garbage Pail Kids All-New Series 1 character 8a Derailed Derek / 8b Train Wreck Trevor, and the United States Garbage Pail Kids All-New Series 5 character 38a Railroaded Richard / 38b Choo-Choo Charlie. All four of the concepts revolve around trains. The All-New Series 6 character is a derailing Thomas The Train that is going over a cliff, and all of the passengers on the train are going with it over the cliff. The Series 10 character is a graffiti-filled subway car. The facial expression and features of All-New Series 6 character were painted very similarly to the Series 10 character. The All-New Series 1 character was dismembered and placed on a toy train that is about to fall off of a table. The All-New Series 6 character and the All-New Series 1 character both have "Train Wreck" in one of the character names (All-New Series 6: 32a Thomas The Train Wreck and All-New Series 1: 8b Train Wreck Trevor). The All-New Series 5 character has a toy train coming out from his mouth, and the train is carrying his organs. Tom Bunk was the artist who painted the All-New Series 6 character and Series 10 character, John Pound was the artist who painted the All-New Series 1 character, and Luis Diaz was the artist who painted the All-New Series 5 character. The United States Garbage Pail Kids All-New Series 6 character 33a Stabbed Sabrina / 33b Targeted Taylor is almost the same as The Sloppy Slobs character 14 Bad Shot Dot. Both of the characters are being hit with knives while they are participating in a knife-throwing act. Tom Bunk was the artist who painted the All-New Series 6 character. The United States Garbage Pail Kids All-New Series 6 character 34a Bobby Q / 34b Barbecue Stu is almost the same as the United States Garbage Pail Kids Series 11 character 455a Charred Cole / 455b Deviled Egbert. Both of the characters are being roasted on a spit. The All-New Series 6 character is roasting himself, and the Series 11 character is being roasted in Hell by tiny devils. Tom Bunk was the artist who painted the All-New Series 6 character, and James Warhola was the artist who painted the Series 11 character. The United States Garbage Pail Kids All-New Series 6 character 35a Webbed Whitney / 35b Digestin' Jasmine has a similar theme as the United States Garbage Pail Kids Series 3 character 98a Charlotte Web / 98b Didi T. Both of the characters are in a spider web. The All-New Series 6 character is caught in a spider web and is being eaten by a spider, and the Series 3 character is a spider on a spider web. Tom Bunk was the artist who painted the All-New Series 6 character, and John Pound was the artist who painted the Series 3 character. The United States Garbage Pail Kids All-New Series 6 character 39a Shot Scott / 39b Fired Fred is almost the same as the United States Garbage Pail Kids Series 14 character 549a Shannon Cannon / 549b Bomb Shelly. Both of the characters are cannons that are being lit and fired. The All-New Series 6 character is a soldier shaped like a cannon, and he is firing out his skeleton. The Series 14 character is a girl shaped like a cannon, and she is firing out globs of puke. Tom Bunk was the artist who painted the All-New Series 6 character and the Series 14 character. The United States Garbage Pail Kids All-New Series 6 character B16 Watery Eyes Walter has a similar theme as the United States Garbage Pail Kids All-New Series 3 character 12a Sprinklin' Spence / 12b Hosed José and The Sloppy Slobs character 97 Waterin' Warren. All three of the characters are squirting out water. The All-New Series 6 character is inserting a hose into his mouth, and the water is squirting out of his eyes and ears. The All-New Series 3 character has a hose jammed into his stomach, and water is squirting out of his mouth while his head spins around. The Sloppy Slobs character is stuck in the ground and water is squirting out of his mouth like a sprinkler as his head spins around. Tom Bunk was the artist who painted the All-New Series 6 character, and James Warhola was the artist who painted the All-New Series 3 character. The United States Garbage Pail Kids All-New Series 6 character B17 Levitating Levi has a similar theme as the United States Garbage Pail Kids Series 5 character 175a Windy Winston / 175b Johnny One-Note and the Bathroom Buddies character 18a Levitatin' Luke / 18b Fartin' Martin. The All-New Series 6 character is a swami that is playing a musical instrument called a bean, and as he is blowing into the instrument he is farting, which causes him to levitate off of the ground. The Series 5 character is playing a trumpet, and as he is blowing into the trumpet he is farting out a musical note. The Bathroom Buddies character is a swami that is farting while on a toilet, and the farting causes him to levitate up in the air. The All-New Series 6 character and the Bathroom Buddies character both have one character name that contains a form of the word "Levitating" (All-New Series 6: B17 Levitating Levi and Bathroom Buddies: 18a Levitatin' Luke). Tom Bunk was the artist who painted the All-New Series 6 character, the Series 5 character, and the Bathroom Buddies character. Just like the previous All-New Series, Topps created a promo kit for the release. The All-New Series 6 promo kits were given out to the hobby distributors and retail distributors. In October of 2006, the distributors were sent a promotional letter from Topps along with the 2-page foldout and dealer ad (see images above). The letter promoted the All-New Series 6 by describing some of the items from the release. The items mentioned were the activity cards, magnet cards, mix and match card backs, and bubble gum. The letter also discusses the long history of Garbage Pail Kids and that it is a pop culture icon. The 2-page foldout (17" x 11" when unfolded) had the character 1a Orange Julius / 1b Peeled Neal on the front, and a picture of what the All-New Series 6 box looked like was on the back. The back of the 2-page foldout also had the following statement: "Shipping January '07". On the inside of the 2-page foldout, there was a sample view of some of the cards (1a Orange Julius, 3a Me Too Lou, 4a Jess Married, 6b Curtis Blow, 8a Rod N' Reel, 9a Carol-Sel (the name was printed without the dash on the foldout), and 27a Lemon Ned (none of the cards were numbered on the foldout)), and there were statements about release and the Garbage Pail Kids brand ("Going Strong! ", "All-New Series! ", "Proven staying power. An evergreen brand", "The original gross-out phenomenon from the folks that brought you Wacky Packages. ", "Viral on-line appeal - half a million Google mentions with hundreds of fun web sites. ", "Loaded with laughs that will keep kids coming back for more! ", "80 All-New GPK Characters To Collect", "First-Time Ever! Mix and Match Build-A-Kid Puzzle Backs! ", "Plus! Awesome Inserts: •First-Time Ever! GPK Activity Cards: Fun Interactive Punch Outs! •MAGNETS: Transforms and ordinary locker or refrigerator into a GPK gallery. ", and "Bonus! Stick of bubble gum in every pack!"). The dealer advertisement (see image above) showed a few sample card images, and it mentioned the activity cards, magnets, and bubble gum. In July of 2006, there was the San Diego Comic-Con International, which was a huge convention for fans of comic books; movie memorabilia; action figures; and just about everything related to pop-culture. In the July 20-23 event guide for the convention, there was a brief listing of the Topps booth information on page 130 (see image above). The information showed that Topps would be handing out trading cards and promo cards. The All-New Series 6 promo card P2 Alien Alan was handed out at the Topps booth. Topps also handed out postcard-size (approximately 6.875" x 4.875") cards to promote the ToppsVault website. In the November 2006 issue of the Previews catalog on page 379 (see image above), there is a description of the various items in the release. The catalog description of the All-New Series 6 mentions animated lenticular flix-pix cards, die-cut magnet cards, regular cards, bubble gum, display poster, and the manufacturer's suggested retail price. The animated lenticular flix-pix cards were not used for the series, and they were replaced by the activity cards. This issue of Previews shows the only print version of 1a Orange Julius / 1b Peeled Neal where the character is being peeled with a knife instead of a potato peeler. In the January 2007 issue of Tuff Stuff magazine (see image above), Garbage Pail Kids were mentioned on page 10 under the New Card Releases section. The All-New Series 6 was briefly described as consisting of activity cards, magnets, mix and match cards, Build-A-Kid card back puzzles, packs containing bubble gum, and a base card set of 80. The ship date for the series was listed as January 29, 2007. In the February/March 2007 issue of Non-Sport Update magazine (see image above), Garbage Pail Kids were mentioned on several pages. On page 5, the All-New Series 6 card 1a Orange Julius is shown (the card was not numbered in the magazine). Also on page 5 under the New & Noteworthy heading, the Garbage Pail Kids All-New Series 6 is listed. While the New & Noteworthy section begins on page 42, the portion on the All-New Series 6 is actually on page 58. This article just mentions the items included in the All-New Series 6, and pictures of the All-New Series 6 characters 8a Rod N' Reel and 9a Carol Sel are shown (the cards were not numbered in the magazine). There is a mistake on the page that shows "Finders Keepers, cont. from page 42" at the top. That is actually a continuation of the New & Noteworthy section. On page 6, there is a full-page advertisement for the ToppsVault auctions that features a few Garbage Pail Kids paintings. On page 23, there is a full-page advertisement for the All-New Series 6, which mentions the items included in the series and has pictures of the characters 2a Showerin' Howard, 3a Me Too Lou, 4a Jess Married, and 27a Lemon Ned (the cards were not numbered in the ad). The All-New Series 6 ad has the phrase "On Sale Now! ", but the series was not yet released at the time the magazine was out. In the Preview 2007 article on page 46, the All-New Series 6 was mentioned to be out in January of 2007, and the All-New Series 7 was mentioned to be out in June of 2007. On the release schedule on page 59, the All-New Series 6, listed as Garbage Pail Kids #6 (Topps), is shown under the January 2007 heading. In the February 15-April 1, 2007 issue of The Wrapper (see image above), there is an article that mentions Garbage Pail Kids. The article describes a few non-sports boxes that have never been discussed in The Wrapper. These boxes were from the 1981 Topps Dukes of Hazzard, 1985/1986 Topps Garbage Pail Kids Series 2/Series 4, and 1992 Donruss Batman Returns. For the Garbage Pail Kids portion of the article, the authors were describing a Garbage Pail Kids Series 2/Series 4 rack pack box that they believed was a test issue. The reason the authors believed that rack pack box was a test issue was because the box looked similar to other boxes from Topps that had contained test products. The Garbage Pail Kids rack pack box they had was all white, measured 12-/38" x 9-3/8" x 1-7/16", had a green sticker with the Garbage Pail Kids logo and the code 5-935-44-01-6, and contained 24 rack packs. The rack packs in the box were made of clear cellophane and had a green, cardboard, Garbage Pail Kids header card that had the code 1-935-93-01-6 (bar code 041116009358). The authors said the rack packs contained cards from the original Series 2 and the original Series 4. They had also showed the difference between the rack packs from their box and the rack packs that were made completely out of cellophane (i.e., no cardboard header card). While their information was interesting, I do not believe it was completely accurate, which is why I did not post a full-size version of the article. The Garbage Pail Kids rack packs had a variety of differences. The rack packs the authors of the article described were common. The first release of rack packs were made out cellophane and had a header card. The first release of rack packs could contain cards from Series 2, Series 2 and Series 3, or Series 2; Series 3; and Series 4. The first release of rack packs also had the same rack pack code and bar code that the authors had described for their rack packs. The only item that was in question was the actual box that the authors' rack packs came in. Possibly, their empty rack pack box was generic or test issue. However, it seems much more likely it was a standard issue since the rack packs inside of the box were no different from the first Garbage Pail Kids rack pack release, and the sticker on top of their rack box matched the design of the rack pack header. Since Garbage Pail Kids were at their height of popularity when the rack pack product was put together, it could have been that the first release of rack boxes were not custom designed because Topps was in a hurry to get the product out. The second release of Garbage Pail Kids rack pack boxes contained the all-cellophane Garbage Pail Kids rack packs, were pink, and were fully designed with graphics. I do question the integrity of the article since the authors posted a high-priced auction for the rack box shortly after the article was published. Since the rack packs were common and their starting bid price for the rack pack box was several hundred dollars, the auction received no bids. Another interesting detail was that the rack pack auction images showed that at least one of the rack packs had a pricing sticker (most likely from K B Toys) on it (someone tried to tear it off but was not able to not fully remove it), and that also leads me to believe that the rack pack box (not just the packs) was not a test issue. I could not tell if the authors were genuinely interested in providing information about the rack pack box or if they just wanted to use the article to help sell the rack pack box. The main benefit of mentioning the article was that I was able to provide enough information about the rack packs that collectors would now have a better idea of the types of Garbage Pail Kids rack packs that Topps had produced. In the January 25-31, 2007 issue of the Miami New Times newspaper (see images above), there is an article about Garbage Pail Kids artist Luis Diaz's custom-designed Munny figures. The Munny figures are 7" do-it-yourself toys, which were produced by a company called Kid Robot. The figures are sold completely undecorated, and they are meant to be painted, colored, and designed any way you like. Luis Diaz custom-designed one of the figures to look like the United States Garbage Pail Kids 10th series character 400a Varicose Wayne / 400b Elaine Vein. The relatively-inexpensive Munny figures can be painted by artists and sold as pieces of artwork for a very nice profit. Luis sold the 400a Varicose Wayne / 400b Elaine Vein Munny character for $500. In the March 2007 issue of Disney Adventures magazine on page 21 (see image above), there is a one-page advertisement for the All-New Series 6. This advertisement is identical to the one in the February/March 2007 issue of Non-Sport Update. The magazine is very small (approximately 5-1/8" x 7-3/8"), which makes it very easy to overlook at the magazine stands. In the April/May 2007 issue of Non-Sport Update magazine (see image above), Garbage Pail Kids were mentioned on several pages. On page 5, there is a full-page advertisement for the ToppsVault auctions. The auction advertisement features the Garbage Pail Kids Series 1 character 30a New Wave Dave / 30b Graffiti Petey. On page 17, there is an advertisement for the Wacky Packages All-New Series 5. The Wacky Packages All-New Series 5 has a card that parodies an unopened pack of Garbage Pail Kids. The name of the Wacky Packages parody product is called "Garbage Pail Geezers", and it is shown on card number 28 in the set. Page 30 features the New Card Reviews section, and there is a review of the Garbage Pail Kids All-New Series 6. The review briefly describes the Garbage Pail Kids card series release history. It also mentions the items the reviewer found after he had opened a full box from the All-New Series 6. The reviewer incorrectly referred to the magnet cards and activity cards as bonus cards. The magnet cards and activity cards are insert cards, and they are completely separate from the bonus cards that came in the bonus boxes and blister packs. On pages 44 and 45, there is an article about the Germany Garbage Pail Kids Series 1 and the Holland Garbage Pail Kids Series 1. The article features most of the information already mentioned on this website about those two releases. The author of the article discusses his Garbage Pail Kids collecting experiences from when he was growing up in Holland. The article also mentions that the checklist card back variation for card 29a for both of the releases has a blue print spot just above the mouth of the character on the front of the card. The article does not mention this, but that same blue spot can also be found on the front of the checklist card back variation for card 29a of the Belgium Garbage Pail Kids Series 1 and the United Kingdom Garbage Pail Kids Series 1. Other than being an uncorrected printing error, the blue spot holds no real significance. On page 51, the Garbage Pail Kids All-New Series 6 (written as "Garbage Pail Kids #6 (Topps)" in the magazine) is listed under the Just Released section. For those of you that were curious about why I had not written any Garbage Pail Kids articles for print publications, the main reason why I decided not to was that this website is accessible to everyone around the world and is completely free, but the print publications are not. (arrow on left side at near top): Cassette tape. (arrow on left side near middle): J. Kennedy's three movie pals & boombox. (arrow on left side near bottom): Transformer. fingerless gloves. / Red wristband. / White & red Converse sneakers. / Bandana - red, white paisley. (arrow on right side near middle): He-Man w/ sword. (arrow on right side near middle): New Coke. Dave's rough sketch of the character was given to Garbage Pail Kids artist Brent Engstrom, and Brent created the final painting (see image above). For the final painting, Brent decided to replace the Coke can to an Adam Bomb Garbage Pail Kids card (the Garbage Pail Kids card is missing the white border). The deadline for the final artwork was very short, and Brent ended up painting it overnight.